11cmh Red Clay marked with 3 dots in a triangle. I thought it may be Julian Pirie, but the mark is indented rather than raised as it appears above. 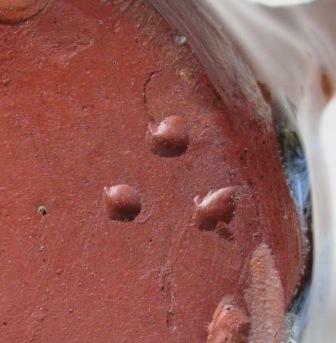 It is an indented mark & looks right to me especially on red clay, I have two more of his pots now & he used a thin runny glaze quite different to other potters.. I'm really interested in the 2 possible Julian Pirie pieces. The green lidded piece looks like pottery by Doreen Wilkinson, a potter in Taipa in the Far North. 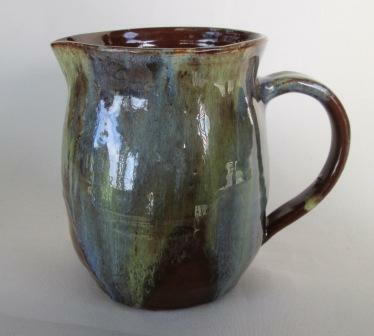 She had that exact same triangular indented mark, always used red clay , and much of her pottery was in the same distinctive mottled green with the darker underglaze. Doreen was producing around late 70s-80s. I bought 6 bowls identical in colouration to the lidded piece, of various sizes, jugs and a large casserole dish directly from her at the cottage pottery. Still have her gold sticker on some pieces. Lots of this in op shops in the North. I'm seeing a lot of it turning up on TradeMe as Julian Pirie but I really think it's Doreen's work. 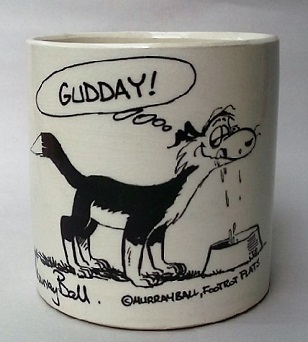 Anyone able to tell us exactly what types of pottery Julian created? Thanks, I'm keen to learn. Hi there nzmagpie57, I'm not familiar with either of those potter's work, so I'm of no help, but I do see that the Marks of New Zealand Potters book has the three dots in a triangle for Julian Pirie. Here is a link to the mark online .. This mark would have been submitted by Julian along with the info added. As every potter has their own recognisable style that is where seeing their work as well as their mark makes identification easier. Hi Ev. Thanks for the reply regarding Julian Pirie's work. There are about 3-4 pieces on TradeMe at the moment that are reported to be Julian Pirie's work. Two pieces are distinctly like Doreen Wilkinson's work- one bowl is in her favourite colours, too although I know she used several colourways, the green was her favourite (and mine). A couple of other pieces are similar to each other but not at all like these pieces. I am sending through about a dozen or so photos of the bowls I have to the pottery forum gmail address. I bought these pieces directly from Doreen when we lived in Kaitaia. Most of the bowls are in daily use, go through the dishwasher and into the oven. Alas, one has a chip but the rest are in excellent condition. My mum has the covered casserole and jug at the moment. I'll photograph them when I get them back and send through the photos then. Thank you so much for all of the photos nzmagpie57 as they show the clay that she used, the style that she had and most importantly the glazes that she used and favoured and even more important her sticker. This gives us the best provenence for her work. I will make a new topic for Doreen as soon as I have time and look at what we have as her mark with fresh eyes. It certainly appears that we have mixed up Julian Pirie with her as they appear to use the same mark. Can we look at this and put the Doreen Wilkinson pots into her topic please and delete them from this topic and see what we are left with here? Both marks & styles appear the same to me. there is alot of these style pots around too. Yes both marks appear to be the same, so we can't differentiate by mark. 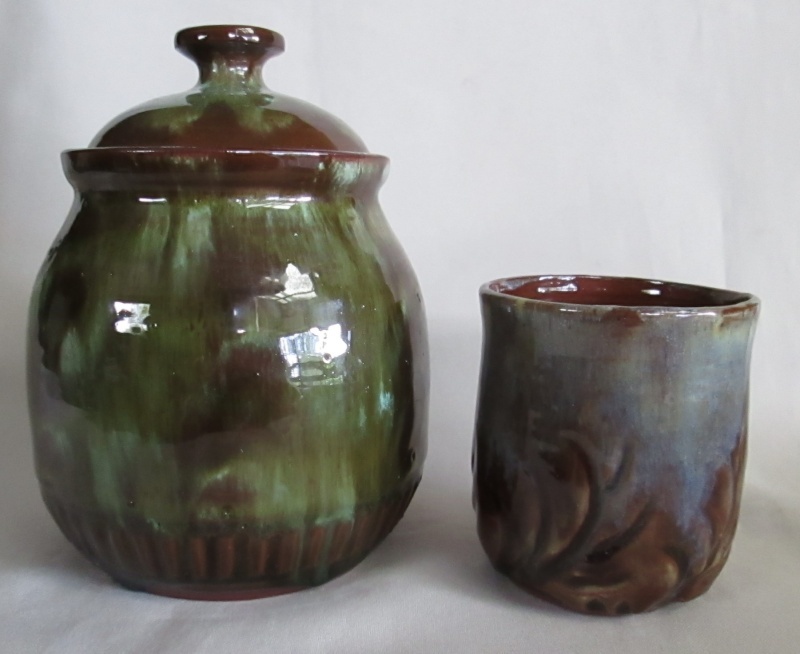 However glazes are usually unique to the potter and from this I reckon that the first photo of a jug is Doreen's and the last photo of the lidded jar and beaker are made by Doreen too. The odd one out is the second photo from mumof1 and the clay looks lighter and the glazes look very different. nzmagpie57 said that Doreen was a prolific potter, so there should be heaps of her pottery around. Doreen Wilkinson's work all has a very shiny, smooth glaze. She didn't use a lot of colour ways- green was her most prolific I think but I recall a lighter browny-green, cream- gold, and blues in her studio. The colours were dabbed and trickled over the darker background, which looks to be a clearish glaze that picks up the colour of the clay. When I looked up Julian Pirie on Google, it says he created stoneware, domestic ware and fountains. 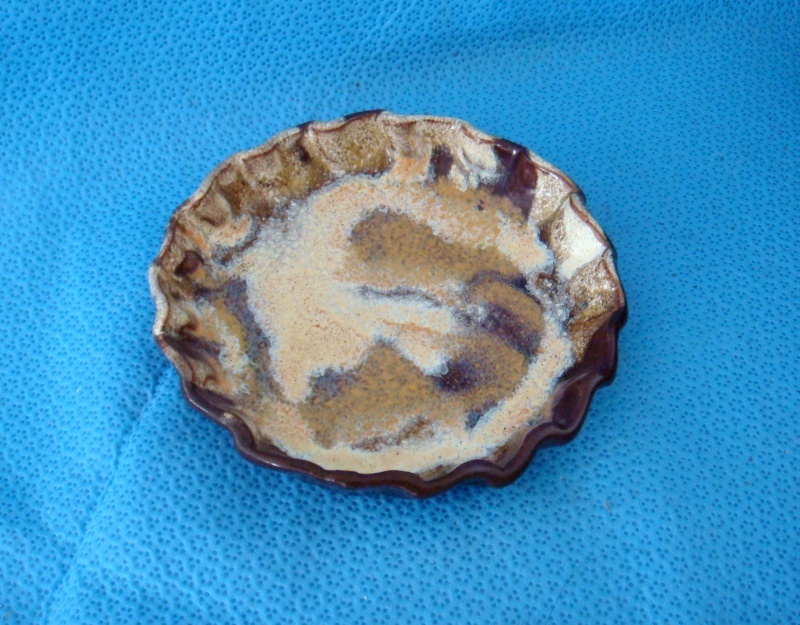 I have seen a couple of pieces listed as works by Julian Pirie on TradeMe recently- they seemed to be made of a rough white clay, almost gritty looking and a totally different glaze to the Wilkinson ones. The mark was 3 distinctly round cut outs in a small triangle, one set of marks was filled with glaze so it looked like 3 little pools. There is plenty of what I am sure is Doreen's work on TradeMe too- wrongly listed as Pirie. I am still a little confused about the mark. 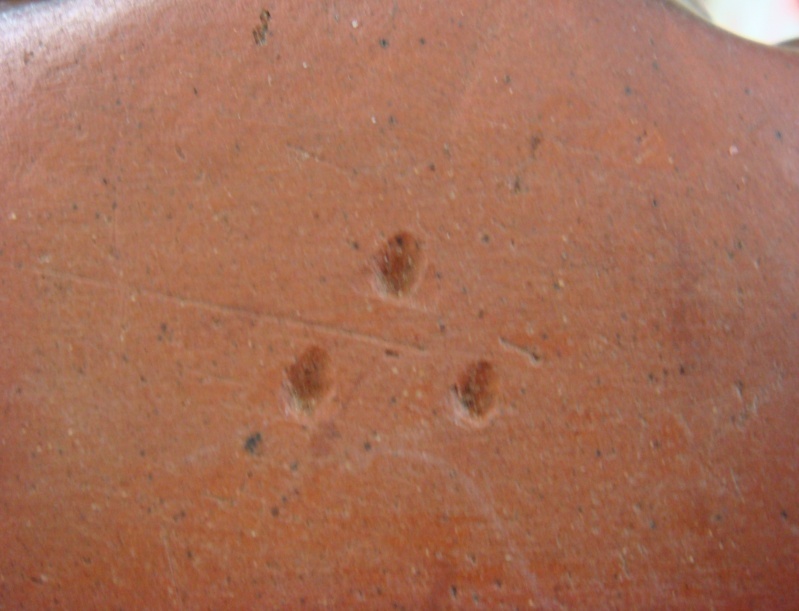 Can anyone verify how either potter does their mark, as the first pic above appears to be 3 raised dots or in relief (as there is light reflection on the side of each dot), whereas my little dish in impressed into the clay? I think in the first photo it looks like 3 raised dots but that's just the light and the way it is catching it. I think if you look closely you'll see it's 3 incised dots. Anne, sometimes if the light is coming from an unexpected direction it creates the shadow accordingly giving the illusion that hollows look raised. Curiously I had noted that with your photos more than anyone else's. In architectural draughting the convention is to have the light coming from the left and above, and I try to arrange my photos that way, but even so I sometimes trick even myself. With these two marks some look rounded and some angular but we are looking at only a small sample so it is hard to draw reliable conclusions.